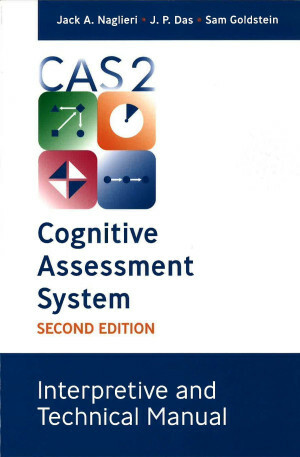 The Cognitive Assessment System, Second Edition(CAS2), the second edition of the Das-Naglieri Cognitive Assessment System, is a well-researched, norm-referenced measure of cognitive ability based on the well-researched cognitive/neuropsychological theory called PASS (Planning, Attention, Simultaneous, and Successive). The CAS2 was designed to measure cognitive processing abilities important for a broad range of differential diagnoses and instructional planning in individuals ages 5-0 through 18-11. CAS2 provides practitioners with a valid and reliable tool to evaluate children's strengths and weaknesses in important areas of cognitive processing. Planning—a cognitive process requiring the individual to determine, select, and use a strategy to solve a problem. The subtests require the solving of novel tasks. The three Planning subtests are: Planned Codes, Planned Connections, and Planned Number Matching. Attention—a cognitive process requiring the individual to selectively attend to a particular stimulus and inhibits attending to competing stimuli. The three Attention subtests are: Expressive Attention, Number Detection, and Receptive Attention. Simultaneous—a cognitive process involving integrating separate stimuli into a single whole or group. The three Simultaneous subtests are: Matrices, Verbal-Spatial Relations, and Figure Memory. Successive—a cognitive process requiring the serial ordering of things. The four Successive subtests are: Word Series, Sentence Repetition (ages 5-7) or Sentence Questions (ages 8-18), and Visual Digit Span. The CAS2 also yields five supplemental composite scores: Executive Function without Working Memory, Executive Function with Working Memory, Working Memory, Verbal Content, and Nonverbal Content. A visual versus auditory comparison is also provided. Interpretive and Technical Manual. This manual presents the information needed to use the test, including a discussion of the PASS theory, explanations of the test’s organization and development as well as information on standardization and norming, reliability, and validity, and interpretation of the CAS2. Red pencils. Two red pencils, for use in subtests requiring written responses, are included in each CAS2 complete test kit. The CAS2 was standardized using a group of 1,342 children and adolescents that closely represent the population of the U.S. Extensive reliability and validity information is reported in the Interpretive and Technical Manual that accompanies the test. The 12 subtest Core Battery Full Scale reliability is .95 with the PASS Scale reliabilities ranging from .86 to .93. Internal consistency, test-retest, and scorer reliability studies were conducted. Types of validity reported include content-description, criterion-prediction, and construct-identification. Validity with special populations, including persons with speech or language impairment, learning disability, gifted and talented, or attention deficit/hyperactivity disorder, anxiety disorder, or Asperger’s syndrome, are reported. Special attention was paid to making the CAS2 fair for minority groups. Validity evidence reported in the Interpretive and Technical Manual demonstrates the test’s value for assessment of diverse groups of children. Extensive reliability and validity information is reported in the Interpretive and Technical Manual that accompanies the test. The 12 subtest Core Battery Full Scale reliability is .95 with the PASS Scale reliabilities ranging from .86 to .93. Internal consistency, test-retest, and scorer reliability studies were conducted. The CAS2 was standardised using a group of 1,342 children and adolescents that closely represent the population of the U.S.